It’s now after we’ve eaten the deep fried blossoms and I’ve decided to add some more pics to show some of our latest gastronomic delights. I must say those beer battered blossoms were awesome. I mixed 1/2 cup flour, 1/8 cup cornstarch, 1/2 tsp baking powder, 1/4 tsp baking soda, 1/2 tsp salt, 1/8 tsp pepper, 1/8 tsp celery seeds, 1 beaten egg and 1/2 cup semi-flat beer and whisk it all together. I dipped the stuffed squash blossoms in completely covering them with the batter and then deep fried them in about 2 inches of hot oil turning with a chop stick to make certain they fried to a nice golden brown all over. We had pan grilled talapia and salmon along with steamed snow peas and a little dollop of the roasted eggplant I made yesterday for the stuffed peppers. See deep fried beer batter dipped blossoms below. Here’s a pic of the eggplant stuffed peppers that I mentioned in an earlier post along with the mystery meat that must have been pork and not lamb and some sauteed squash blossoms. In case you don’t know, you can click on any photos shown here and get a larger version which you can further enlarge and then see clearly what I’m trying to illustrate with my photos. As I mentioned previously we had what we thought was a lamb roast that looked more like pork once we seasoned and roasted it as if it were lamb. It didn’t taste or smell like lamb and the look and texture of the meat looked more like pork. So for dinner last night I decided to make a pork curry dish and see if that came out. I looked for a recipe until I found one that I had all the ingredients for so I wouldn’t have to go grocery shopping. I cut the meat into one inch chunks and browned them in a little butter/olive oil while I sliced thin wedges of a half onion and peeled and sliced a golden delicious apple. I fried the onion and apple with the meat til they were tender. Meanwhile I made some jasmine rice in the rice cooker to serve the curry over. Once the meat mixture was cooked about 10 minutes I added 1/4 cup raisins and two cups chopped tomatoes (home canned), and a blend of 1/3 tsp salt, 1/8 tsp pepper, 1 1/2 tsp curry powder, 1 1/2 tsp madras curry powder, 1/8 tsp cayenne pepper, 1 Tbsp brown sugar, 2 Tbsp flour that were whisk with about one cup of chicken broth. I stirred this all together with the meat mixture and cooked it until it thickened and then cooked it a few minutes covered. I served the curry over the rice garnished with sliced almonds and Major Grey’s hot mango chutney. 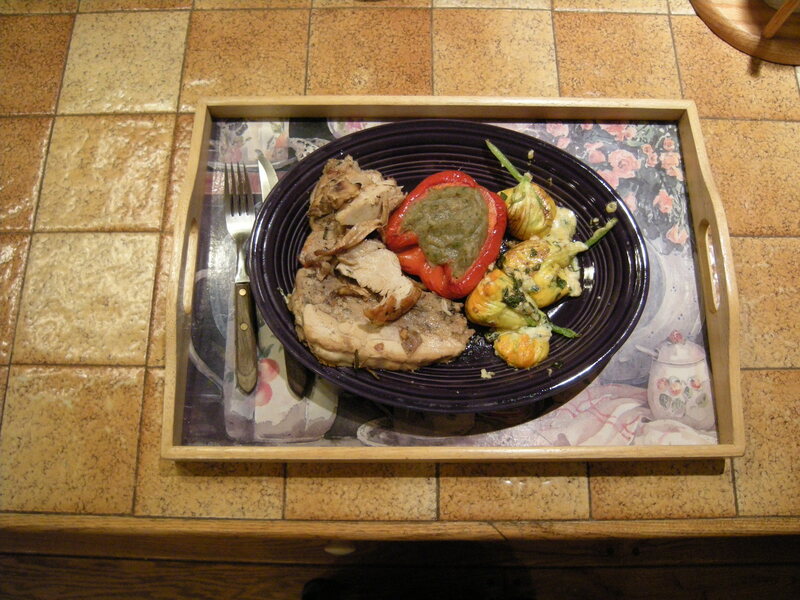 The dish was a very tasty way to use up the mystery meat. 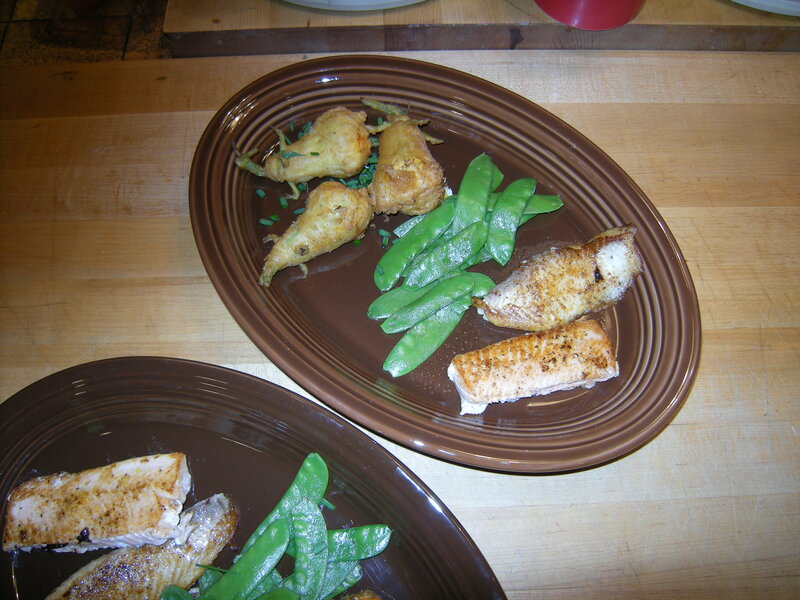 We’ve been having lots of the sauteed stuffed squash blossoms. I plan to do them in a beer batter tonight as a change. My daughter said that is how she prepares hers and they are very good that way she says. It they come out looking good I’ll add a picture next blog. It’s so pleasant here today — not that extreme heat like we’ve had the last few weeks. It was nice to sleep with the windows open for a change. Well last night we had a lamb roast that had been in our freezer that we discovered…it was very unusual. It was cooked almost well done by accident and when we carved it the meat was very light colored and seemed to have the texture of pork. Besides it didn’t smell like lamb so we’re confused. It was very tender and tasted okay but not like lamb. Tonight we having some of the leftover roast from last night with eggplant stuffed red peppers and stuffed squash blossoms sauteed with sage. For the peppers I roast two small eggplant at 375 degrees until they’re softened. The eggplant will start to sink in. Once they’re cooked and cooled a while, I split them and scoop out the interior of them and using my hand blender I blend them up with a little olive oil, lemon juice, chopped parsley and minced garlic. I cut the peppers in half and scoop out the seeds and then roast them about 20 minutes at 350 degrees. When I’m preparing dinner, I fill each half of the peppers with the eggplant mixture and put them back in the oven at 350 degrees about20 minutes or so. Meanwhile I’ll fry the squash blossoms and heat the meat and supper if ready. No sign of the newly fledged wrens or their parents. They certainly fledged on a day when the weather turned treacherous. A strong wind and rain storm blew in and we had lots of rain. I hope the birds knew where to seek cover during the storm. Not much new on this Friday so today’s blog will be short and nothing planned for the weekend. Don made some cherry bounce which should be ready in December. I defrosted both freezers and made a list of their contents so we can keep track of what we have. There is still the stuff in the under the counter freezer that needs to be tallied too. Today the baby wrens looked all decked out in their feathers when I checked early this morning when I went out to collect squash blossoms. By mid-day they were sitting on the edges of their nest all fluffed up and I figured they would be ready to fly tomorrow. See picture below. I checked an hour after this picture was taken and the nest was totally empty. Interestingly enough I found little pieces of snakeskin in the nest. My husband had just read that birds will put pieces of snakeskin in the nest to ward off predators. He wasn’t certain if it was the sight or smell that stopped predators. Any way the birds have fledged and I didn’t see any wrens around the area so parents and fledglings are gone from the surrounding area. As for last nights pizza it was delicious and I have some pictures to post to show how good it looked. Tonight we’re having roasted leg of lamb, mini green beans and some of my home grown potatoes. Pictures tomorrow when I update my blog. We’ve had a busy few days so I will update everyone on what’s been happening. We went to a Nettle Fest at Camp High Rocks in Pocahontas County on Saturday. We ate some nettle greens along with some other foods they offered. We listened to some of the music they had and strolled around the campground looking at various crafts and silent auctions. The event is a fund raiser for the camp which is offered to young girls. It was established to encourage girls to pursue college degrees and the camping experience offers them some training, guidance in their career choices and helps built their self esteem. While there we decided to gather some fresh wood nettle tops to bring home. Wood nettle is related to stinging nettle, but has much fewer stinging hairs. We planned to make what we’re calling Nettle Tonic. In some recipes it’s referred to as tea or beer. However, it doesn’t really qualify as beer because it contains no malt extract. While researching nettle and beer, I came across a story about some beer made in Scotland that has the highest alcohol content ever. It is beer that has nettles and juniper berries added to it. It takes 200 bottles of this beer to finally make one bottle. They keep freezing it and removing the frozen crystals of water to concentrate the alcohol portion. When it is finally bottled the bottles are stuffed in animal skins from hares, squirrels or stoats. It is not only the strongest beer, but also the most expensive and it is a very limited run of just 10 bottles. A stoat costs 500 pounds and a squirrel costs 700 pounds. The strongest brew called The End of History is 55 percent alcohol. There are two others, Tactical Nuclear Penguin (32 percent) and SinkThe Bismarck (41 percent). Now we don’t plan on trying to make anything comparable to the above. Our goal is to make a great tasting tonic which may have a very low alcohol content. For our recipe we boiled the washed leaves of the wood nettle and stained off the leaves and let it cool. Then we added 2 pounds of brown sugar, juice of four lemons, a tablespoon of sliced ginger, 2 tablespoons of cream of tarter and 2 tablespoons of yeast and mixed it all up and put it into a sanitized carboy with a water trap stopper to allow excess gas to escape while it ferments. This is allowed to ferment a few days and when the gas stops bubbling it is this ready to bottle. Then chill and it’s ready to serve. 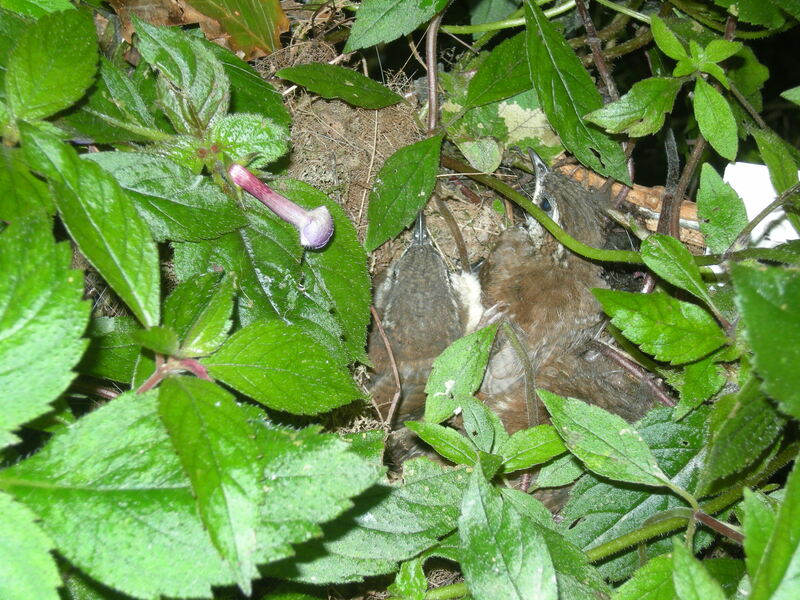 An update on the wrens — the young birds have more feathers every day and are growing each day. They sit with their beaks pointing upward so that I can see the tops of their brown heads and their light throats. If I jostle the nest they open their beaks thinking I’m ready to drop food into their mouths. They really grow fast and it’s fun to see how quickly they went from naked hatchlings to full feathered babies. We had another visit from the young bear last evening. I was sitting in my chair by the bay window watching jeopardy and looked out to see his head just under the bird feeder in front of the windows. He seemed to be considering how he could get the suet out of the cage it was in. Don went out and shooed him away and he took off across the front of the house and to the vacant lot on the other side of the driveway. Soon I heard a car come up the road beeping so I figured he was down the hill and in the road. 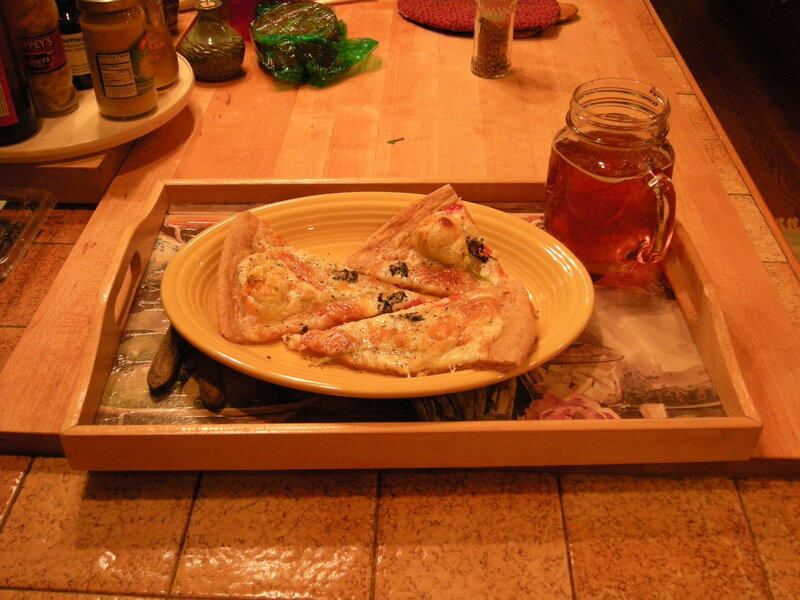 Tonight we’re having home made pizza based on a new recipe idea given to me by my daughter, Annalisa. 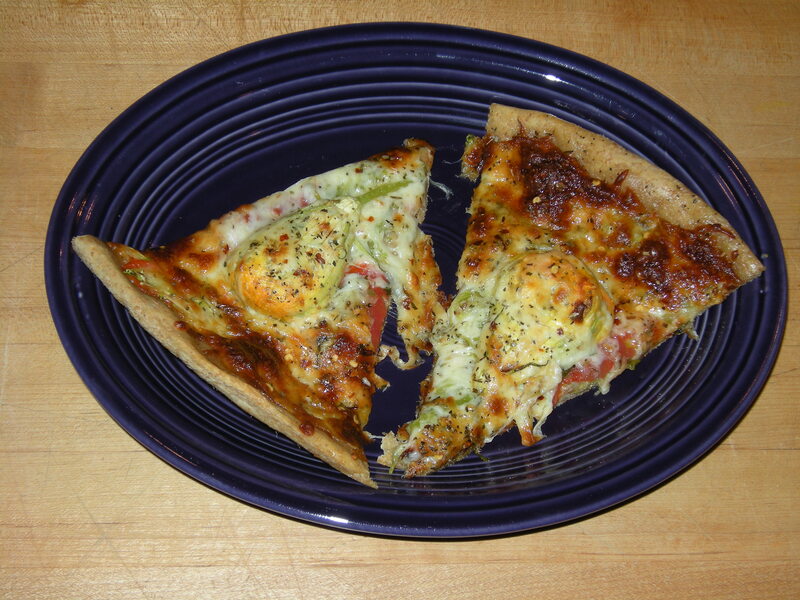 She calls it Rachel’s pizza as a memorial to a friend’s sister. I made whole wheat dough in the bread machine for the crust. I plan to put squash blossoms stuffed with ricotta cheese, parmasean cheese and cheddar with chopped mixed herbs — sage, basil, tarragon, chives & mint on it along with some garlic olive oil marinated hot red pepper slices and top it with slices of mozzarella also marinated in the same oil. However, I guess I should describe exactly how I prepare the squash blossoms. First of all they need to be picked early in the morning when they are wide open and are more easily stuffed right then. So I try to keep a mixture of chopped herbs blended with the cheese in the refrigerator so I can do that every morning until I have enough to use. I take a little dollop of the mixture and push it gently down into the bottom of the blossom and then continue to add more until it is filled up to where the petals split out into lobes. I then fold the petals over to close off the top. Some recipes say to twist the petals, but I developed my own technique which works well for me. If you look back through my posts there is a picture of some stuffed blossoms. Other recipes suggest dipping the blossoms in a batter such as tempura and deep frying them in two inches of hot oil. I usually don’t batter mine and saute them in butter with chopped fresh sage turning them to brown on all sides. But for the pizza I just put them around on top of the crust uncooked and then add whatever else I want on it as mentioned above along with some chopped basil on top. Tonight I’m making a second similar pizza since my dough recipe is enough for two pizzas. I just wrap the dough in saran wrap and refrigerate it until I’m ready to make the pizza. It will keep a few days, but generally I use it within two days. Tonight I’m adding shredded zucchini and a few thin slices of habanero pepper otherwise it will be the same as last nights. 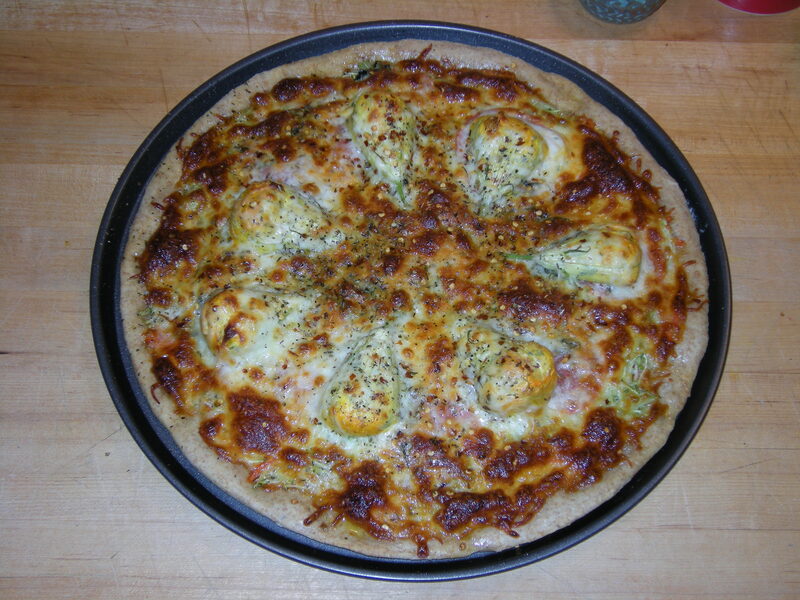 This pizza is follows my daughter’s recipe more closely than the first one. This post has been written over the last couple of days and I’ll finish by adding that we filtered the nettle tonic this morning and put it in the refrigerator. It has a wild flavor, but tastes pretty good although we tried it unchilled. I’m certain it will taste even better when it is cold.